After successful launch of diamond studded Architect gold pen at Harrods in London, award winning British designer Jack Row will release his new collection of luxury British writing instruments, dubbed Jaali and City, at the prestigious Goldsmiths’ Fair in the City of London from 24th-30th September. The first one, inspired by Moghul Indian architecture and art of latticed screens, is more luxurious and reflects the high precious metal content, while City is more affordable and is for everyday use. “Each pen is handcrafted from solid sterling silver and is stylishly minimalist, yet discreetly defined with precious gemstones such as diamonds, rubies and sapphires. These luxury writing instruments will appeal to the discerning city professional who requires everyday practicality, and that added ‘wow factor’”, Row said about collection. 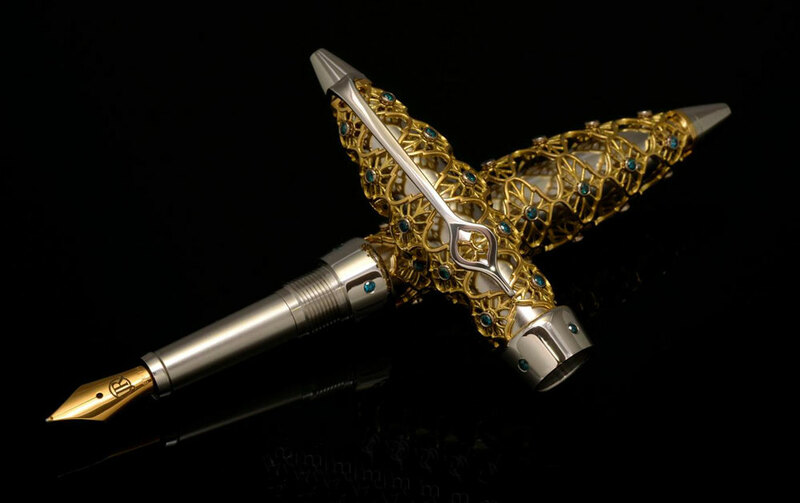 Each piece in the Jaali collection of luxury fountain pens and cufflinks have been crafter in England from solid sterling silver and 18ct gold and set with accents of precious petrol-blue diamonds, while pieces in the City collection are also handcrafted but from more modest solid sterling silver and precious gemstones such as diamonds, rubies and sapphires. “Each piece is individually made to order in my Birmingham studio and carries a UK hallmark, struck by the Birmingham Assay Office, guaranteeing the authenticity and quality of the precious metals. Each pen also features a solid 18ct gold nib, although all the designs are also available as a roller-ball version, upon request”, he added to promote contemporary British design and craftsmanship. The solid silver Jaali pen would retail at $11,900 while the solid sterling silver and 18ct gold filigree Jaali pen would be priced at $44,400. The sterling silver and blue diamonds Jaali cufflinks would retail at $1,230 while the cufflinks from 18ct yellow and white gold with blue sapphires can be bought for $7,900.